When I'm afraid, I'm quiet. It's a defense mechanism. Learned from my childhood no doubt. If I reach back I remember my very young parents fighting. That's what I remember most about my first couple years here on the planet. The fights. There was a time I blamed them for what I thought I was or how I thought I turned out. But there comes a time for most of us when we wake up and realize our parents were just young and messed up like us. It's nearly impossible to relinquish what we pick up or are born with from them. And why would you? We were sent here to be with the ones we are with for a purpose. Not so much a reason. Man makes reason. Our brains are like little meaning making machines. It's great when it works in our favor. When it's not it's easy to keep going back to our parents for blame. Life's a beautiful thing to behold now that I've finally grown into my own skin. This phenomena is only a couple years into phase now. This by no means means I think I know anything. I'm blown away with miracles and possibilities almost daily. I love my parents now more and more as I grow. Our parents are our first teachers. I know that's not always a good thing however, in hindsight I realize that it's our job to make the next step in our family's evolution. Sometimes that involves uprooting belief systems that lay deep within our psyche. Most will never be aware of the opportunity they have to carry the ball down the field. That's okay I'm not judging anyone's path. This blog is merely a continuance of my current story. I played downtown (Nashville) last night. I truly enjoy the freedom of last minute fill in spots on Broadway. I never plan for those calls. They always seem to happen right as I get in from long road trips. When they come I'm sometimes reluctant to go. Usually though, when I get there I remember how much fun it is! Everyone comes there to be free and be a part of the music. What a dream come true to entertain people from around the world who either know what fun is to be had here or are ready to learn. Lower Broad is a party twenty-four seven plain and simple. The high from playing in the middle of it all usuallly lasts a couple hours after the gig. I love the drives home too. I get to see the downtown lit up and cherish the moment remembering that I'm a part of it. A little known fact about me is I'm truly a part of the Nashville skyline. I wired the Omni Hotel. A few years ago I took a job in the electrical union here, IBEW local #429, and ran thirty five men up the Omni Hotel tower over a one year period. We are responsible for the Vegas style lighting effects you see too. That was a dangerous task. I personally laid out almost every hotel room by hand. Three hundred and sixty or so I think. Now, like my tradesman grandfathers before me, I can drive down the road and point to the kids and say "Daddy did that." And that building will surely outlive me. On the way home last night a line hit me. "In our lives there will be teachers and guides and we don't have to find them." I used to worry about time. I was always chasing what I was running from. That's the title of my first Nashville album. It's funny and not funny how many of the songs I've written have become self fulfilling prophecies. I worried about time so much back then that I didn't enjoy all my creations as they were learning to walk if you will. Songs are like babies. You can't just put a baby in a cannon to get it from point A to point B. You've gotta teach that child to walk and allow it to grow. The rest is up to the I am. I cherish the flow of songwriting. I hunger for it. I'm not quiet anymore with the impositions that arise in the midst of spilling my guts. I'm not afraid of my story anymore. When I was eighteen years old I was a guitar tech for a band called Moses Brown. They opened for one of my early influences Larry Crane. I remember how he seemed to shine up there on stage and how people were captured by his songs and showmanship. When he turned around at the end of the show he looked directly at me. That's what I thought anyway. I'll never forget that. He had just thrown his guitar across the stage where his tech thankfully caught it. He had a million dollar smile and a twinkle in his eye. He was in his prime. Recently departed from John Mellencamp's band and on fire with his own show. He was my first real life musical hero. Shortly after that, I got a call to play guitar for a guy named Frankie Cash. Frankie had a deal in Nashville but blew his advance on the riverboat. He reached out for a, well free really, band to present to his people in Tennessee. That's how the story was whispered to me went anyway. Didn't matter how the job came about for me though I was happy to be there. I'd been teaching guitar lessons at the time and this opportunity seemed like the next step towards being a pro. I often think, if I had known how long this road would be I probably wouldn't have done it. I'm grateful not to know the future. I'm thankful to know that wasting time depressing the past or being anxious about what's to come is nothing more than a wish to keep riding the same ride over and over. Frankie had a collection of songs for us to learn from a publishing house down on music row. It blew my mind to be learning songs that hadn't been released yet and were written by guys like Eddie Money. That's where I met John Crane. Larry's little brother. John was a drummer. A large, loud, over-the-top man with a boisterous laugh. He knew everything there was to be known about the history of music in our area. He made me unplug all my guitar pedals and go straight into the amp. He turned me onto Merle Haggard and Steve Earle. One time we were driving down the road to a gig and he had Earle's album El Corazon playing. I was rocked by the sound of that record and asked who produced it. John told me Ray Kennedy. He told me once he was always more into good songwriters than good singers. John was one of my first musical guides and next to my wife, my best friend. John was the first person to take me under their wing in music. He was like a big brother. He inspired me to strive to be a great songwriter first. He always listened to my songs and was honest. Many times he told me "Don't ever write a song like that again." I laugh just thinking about all the mischief we'd get into. John had just turned thirty when I met him. Our time in the Frankie Cash band was short but our road together was long. With John, I learned the ropes of being a working musician. It's one thing to work a day gig and buy the best gear then go play on the weekends. It's quite another thing to play for seventy-five to a hundred bucks a night and feed a family. You learn a crap load of songs and to do other things to make ends meet. Like electricity for me. For years and years I pieced together sound systems and decent rides. Decent as in working and I could usually fix on the fly. Looking back though, that's what it means to pay your dues. John knew that and was there to help me when things looked bleak. There was a time in my life I called him for help before my Dad. Luckily, whatever version of band John and I had together though, had decent gear. John had a good job as an insurance man. He had the system, the trailer, and always drove. I always felt like no matter what everything was gonna be okay if John was there. One time he even bought me a guitar. Mine had broke and I had other problems. Like getting my driver's license back and paying back rent. Oh yes, on and off for many years I'd take every Indiana backroad from gig to gig with no DL. Believe me I know some roads! 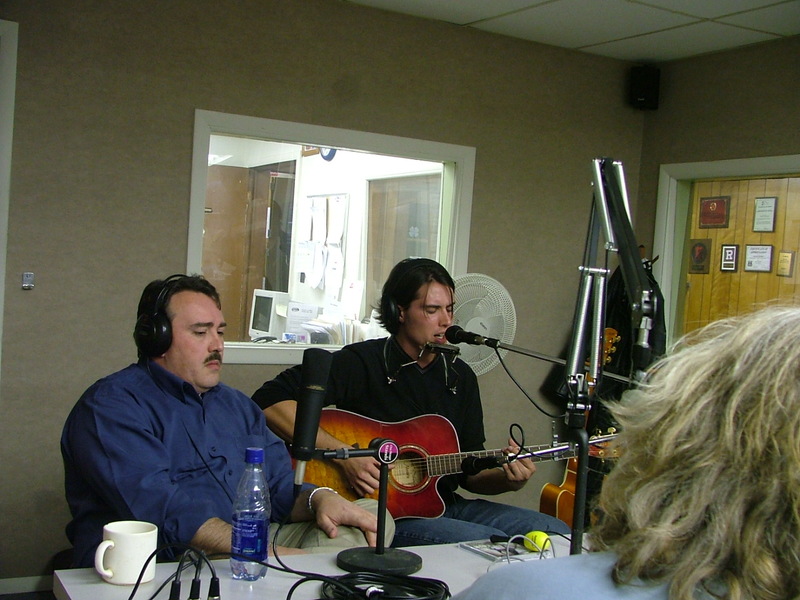 Eventually playing music with John led to working with his brother Larry. Around that time Larry had released his album Wire and Wood. At the same time I made an acoustic album called Renaissance Man for an indie label. John supremely disliked the limited way I was presented on that record. I had not yet brought all my ingredients together as one on tape. I had also during that time had been simultaneously writing a more rock set of songs. The prize of the bunch was called Seashells & Blacktop. I got the idea for that song after stumbling out of a brunch in Florida. We had been out running the roads with Larry and playing along the Gulf side. John asked Larry to produce a demo on me after listening to Renaissance Man. Larry agreed and we recorded at The Static Shack up in Indianapolis. John paid for those sessions. I have so many stories inside of stories that I know I'll return to parts of this blog again. The demo we made and, Seashells in particular, led me to my publishing deal in Nashville. Subsequently it's led to all the music I've released since. Had I not met John so young I may not have taken these steps at all. I am grateful to have listened to him even when I didn't want to. It's a blessing John was there early on to watch me learn and to pick me up when I fell. John passed away in January. It has been a crushing blow for me. It's taken some time to heal enough to return to what he and I loved to do the most. Make music. On his deathbed, I delivered an advance copy of a record I just made with Ray Kennedy. One more time we rocked again. I know he was proud of me. God speed my beloved friend. I'll see you there.